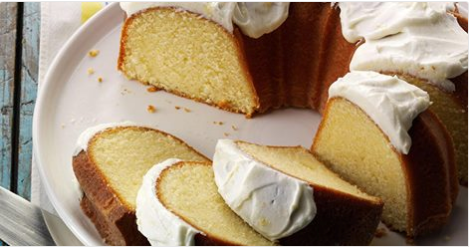 California Lemon Pound Cake Recipe | FoodGaZm.. In a large bowl, cream the butter, shortening and sugar until light and fluffy, about 5 minutes. Add eggs, one at a time, beating well after each addition. Stir in lemon peel and extract. Combine the flour, salt and baking powder; gradually add to creamed mixture alternately with milk. Beat just until combined. Pour into a greased 10-in. fluted tube pan. Bake at 350° for 70 minutes or until a toothpick inserted near the center comes out clean. Cool for 10 minutes before removing from pan to a wire rack to cool completely. In a small bowl, combine the frosting ingredients; beat until smooth. Spread over top of cake. Yield: 12-16 servings.